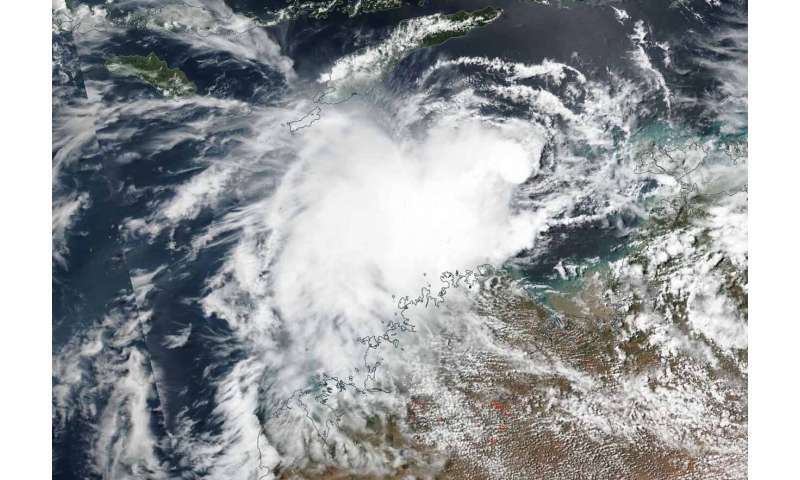 NASA-NOAA's Suomi NPP satellite passed over the Southern Indian Ocean and captured a visible image of Tropical Cyclone 23S or Wallace, on April 5, as skirted the coast of Western Australia. Credit: NASA Worldview, Earth Observing System Data and Information System (EOSDIS). 23S is expected to be renamed Tropical Storm Wallace as it falls in Australia's area of responsibility, and follows their naming list. NASA-NOAA's Suomi NPP satellite passed over 23S on April 5 and the Visible Infrared Imaging Radiometer Suite (VIIRS) instrument provided a visible image of the storm. The VIIRS image showed an elongated storm. The southeastern quadrant of 23S was over the Kimberly coast. The Joint Typhoon Warning Center or JTWC noted "animated multispectral satellite imagery which depicts isolated, deep central convection and shallow rain bands." Tropical Storm 23S is forecast to move west-southwest while intensifying over the next four days as it moves parallel to the coast of Western Australia. The ABM noted "there remains a slight risk that the cyclone could approach the west Pilbara coast next week."